Having driven the saloon version of Citroen’s oddball new CX recently, I approached the new estate with mixed feelings: anxiety, irritation and concern. On the plus side, a tour in France is always accompanied by some excellent chance to savour the local nourishment and to sip regional wines. On the other side of the ledger stand the risks of trouble with some new and partially elaborated concatenation of complexity and carelessness, namely, any new French car. The CX Safari takes the main ingredients of the saloon and adds 98 inches of strangeness in the form of an extended rear section and a fifth door, the fifth door one might imagine the four door is asking for but has not yet received. At £4,230 the car is certainly reasonable value for money, if one overlooks the potentially disconcerting ride quality, nervous steering and trembling speedometer not to mention the superficially eccentric appearance of this already deeply eccentric car. Vauxhall, all is forgiven! Among the items of standard equipment are four very soft seats and a large load bay, swathed in vinyl. There is a single rear window wiper and one washer, supplied with a large reserve of Evian; the front windows are electrically actuated by means of small switches within easy reach of the driver (simply dab the switch and the window is raised by Servo motors); the brakes are ventilated disc at the rear and at the front. I took the car on a test drive from Pau to Périgeaux (though had planned to motor on to Paris) to see how it managed a mixed diet of lanes, autoroutes and main roads. Starting off one must await the car’s patented Citroen suspension system to pressure up, time for a leisurely Craven “A”. Where is the ashtray? It is the spherical object perched like an all-seeing eye on the centre console, something I took at first to be an air-freshener. The rather coarse 2.0 litre engine drags the car’s 3,078 lb forward with some reluctance but driven with some care, it can just about cope (even with nine boxes of red on board). At low speeds the steering is very direct, meaning one careens left and right like a child learning to ride a bicycle. By the time I had reached Auch I had just about learned to accommodate the car’s steering and was exhausted as I pulled into the Hotel Du France. A large plate of garbure helped restore my strength and a bottle and a half of Brulhois raised my spirits. Sitting outside the hotel, I had some moments to consider the car’s appearance, scanning the car’s 16 ft from left to right like a lion scanning the horizon of the Serengeti. The roof is raised aft of the B-pillar and Citroen have designed new rear doors, something of an indulgence in these increasingly competitive times, considering the cost of tooling. A large third side-glass makes for an airy space inside the car but spoils the CX’s lines somewhat; the rear wheels have partial covers, making for a rather heavy look. Ford’s sensible Granada does not need this kind of decorative excess so why do Citroen, one is forced to ask. At the front, the car is much the same as the saloon, and some will find it acceptable. The second day, Auch to Périgeaux, I opened the throttle with a tad more confidence and found the steering settled down, having less assistance at higher speeds. It felt a bit heavy but had decent turn-in. The ashtray got a bit full but remained attached to the car despite hard, understeerish cornering. It might ride somewhat floatily but the car grips fairly well, in spite of the dreadful undulations of the road surfaces. The engine turns out 102 hp (four speeds and reverse) at 5,500 rpm, with 112 lb ft of torque at three thou. If you keep it running in the middle range the car keeps up with traffic quite well. By the end of the tour and after several stops at various vineyards for tasting, a clearer picture of the car was beginning to emerge: large, long and French. I can’t see a lot of need for a car like this in Britain. If you need to carry people, try a traditional saloon and if you need to carry as much as the Safari can then try a Transit van, which looks more attractive. Car seat covers in brown and black terry cloth, embossed with the Citroen chevrons will be available in October. I thoroughly enjoy Archie’s road tests. He perfectly articulates the English* suspicion of “funny foreign cars” that I remember very well from my childhood. He deserved a national stage. The Daily Mail, perhaps? * By which I mean British Isles, to be clear, and it’s a crude generalisation. Daniel: the outlines of Archie Vicar´s life are poorly understood. The only evidence is these transcripts such as they are. There are no known diaries. He left no heirs. His wife passed away a few years after he did (c. 1983) and their house was demolished. A Tesco now stands there, on Pickersleigh Rd, Great Malvern. I wonder if Tesco would let me put up a blue plaque there? You´ll notice a lot of the newspapers have closed since he wrote for them and he dotted around the country like a wasp, never having steady work. I must one day plot the locations of his former clients. It´s not unlikely he might have approached the Mail but I think Vicar´s view were too far to the left, too internationalist for a paper like that. Maybe the Express would have been his venue. However, there was another writer there, Basil Cardew, who seemed to have been too well established to winkle out. Vic: yes, you are absolutely correct. I love the CX Safar; many more conservative UK buyers will have been very nervous about it. I confine myself to what the big estate space would have been be useful for. Big enough for farm animals (not lions), but you can’t hose it down afterwards, so it’ll have to be for the pair of German Shepherds. But you can’t go off-road to get them to the flocks. Market stall-holders do better, although round our way the Euro boxes are preferred, and, being a bit posh here, Zeta’s the favourite. That’s the Francocentric view — they didn’t sell many here. I suppose British antiques dealers might have been seduced away from their natural Volvo habitat if it had been cheap enough, but I doubt it did that. Citroen CX. In addition to its other mechanical eccentricities, one of a very small number of front wheel drive cars to be built as body on frame. With the funny characteristics that the body was fully self-supporting whereas the chassis was not. After sixteen rubber elements were undone the body could be lifted off the chassis and there was a special rod that had to be inserted between the top suspension carrier bar at front and the transversal tube at the rear to keep the chassis from getting bent without the body holding it straight. The structure up front was extremely stiff and kept suspension forces from entering the body, thus enabling the suspension geometry necessary for DIRAVI. The concept is similar to Lancia’s Flavia/Fulvia or some BMC Greek Al designs. Dave, how much torsional rigidity did the frame have ? It looks as if it might have some torsional rigidity, but very little bending rigidity. That would be in contrast to the later GM car frames, which had good bending rigidity, but almost no torsional rigidity due to open channels for past of the length. Neither chassis look to have much torsional rigidity – you need multiple crossmembers for that, and some height as well. The bodies supplied the missing strength – like the ’77 GM B bodies and this Citroen. They look to be there more as an aid to assembly than anything else. Never was a fan of flexi-flyer chassis/body design. If Jaguar didn’t need it to get the XJ6 and XJ40 to have the least road noise and best vibration isolation around for a couple of decades, then what were the rest of them thinking? Lazy design, I think, although with Citroen there probably was a certain Gallic logic not immediately obvious. Fixating on one design method like a separate chassis always being more isolated as some matter of faith rather than reason, leads to stagnation of thought. Rolls Royce went unitary for 1960 as well. 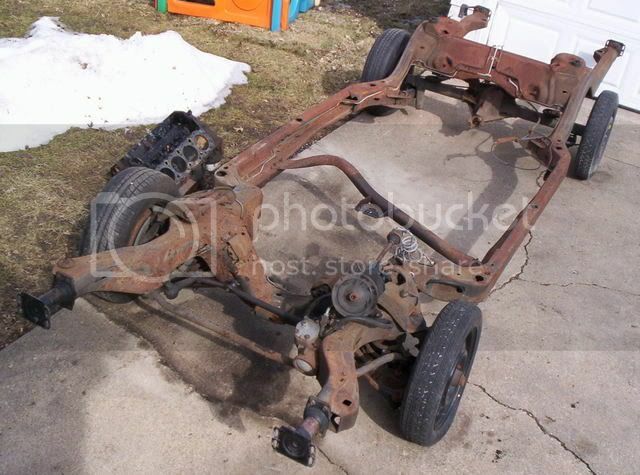 If you don’t have a solid axle banging around at the rear, there’s about zero justication for a separate chassis. But US car design was stuck in a 1930s mould for decades, and still is with pickup trucks. No, it is a matter of basic physics relating to the resonant frequencies of masses attached by bushings. A tuned mass damper with a higher mass has a lower resonant frequency. A good explanation of why low resonant frequencies in chassis frames and subframes is advantageous is provided by (hey!) 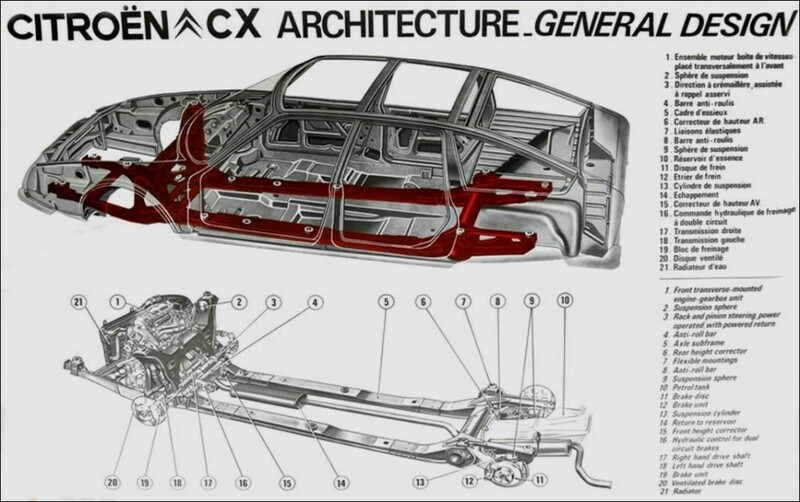 this document from Jaguar describing the development of the XJ40 rear suspension. A single chassis with attached components (engine, transmission, bumpers, exhaust) has a much higher mass than either of two separate subframes with their attached components. Hence the single chassis has a lower resonant frequency, and will absorb lower frequency bumps and vibrations, and do it with bushings with less deflection. With the XJ40, Jaguar was so thrilled to create a rear suspension design that had a resonant frequency nearly as low as any body-on-frame car. There are no bushings whatsoever in the CXÄ’s rear suspension as the (cast) trailing arms are running on taper roller bearings. Up front, the upper (forged) wishbones are on taper rollers, too, and the (equally forged) lower wishbones run on unusually long conical rubber bushes combined with pressed fibre guides. The vibration is absorbed by the chassis and the rubber elements between it and the body. The self centering of the DIRAVI steering needs very precise wheel geometry (look at the numerous ways the steering can be adjusted, down to two special tools provided to adjust the up and down position of the rack’s ends) and the chassis provides this precise location of suspension elements. There is nothing worse to drive than a CX with its self centering not properly pointing in the straight ahead direction. Just for clarification, when i write about frame bushings, I’m talking about what GM calls “body mounts” between the frame and body, not the bushings ( in Citroen’s case bearings) that attach the control arms to the frame. I am reminded somewhat, when reading the bold Archie’s musings, of Roy Lanchester who occasionally makes his presence felt on Richard Porter’s (of old Top Gear and new The Grand Tour fame) spoof website, Sniff Petrol. Interesting. I started transcribing Archie Vicar around 2008. When did Roy Lanchester appear? I just had read. He seems to be much funnier than poor old Archie. He is also alive whereas Archie Vicar is not and has not been since about 1982 when Lanchester was probably about 20something. Roy Lanchester appeared first in 2014 if Sniff Petrol´s archive is complete and he has not appeared elsewhere, comfortably after my transcriptions started. There is a good reason Mr Sniff Petrol is where he is today. That item was, I must admit, the funniest thing I have read in more than three years.